The Cleveland Indians dealt the Texas Rangers a 11-5 loss at Globe Life Park in Arlington. Alfredo Silva was the star on offense. He was 3 for 3 with 2 home runs, a double, and 2 walks, while scoring 3 runs and driving in 3. Cam James earned the win for Cleveland. He lasted 6 innings, allowing 2 earned runs on 7 hits, while striking out 5. With the win, he raised his record to 10-7. The save was Mike Hudson's, his 3rd. 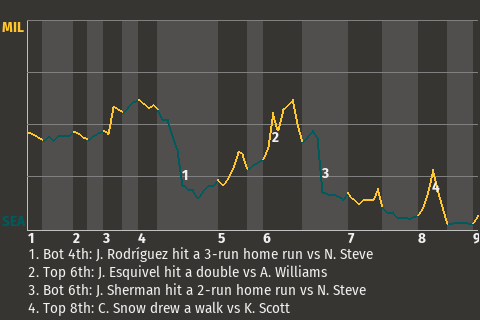 Silva had an important at-bat with the bases loaded in the top of the first, when he drew a walk, driving in 1 run. The Indians went on to win. "One win at a time, one game at a time. We try not to get too far ahead of ourselves," Silva told the Cleveland Chronicle. The Indians now have a mark of 52-46.